Answering the question "Where is the bus-station?" is complicated in New Zealand. Many places don't actually a specific bus-station, there is just a bus stop on the roadside, which is used by all the bus companies that stop in the the town.. In the larger cities, there is usually one or more bus-exchange or similar. And it may be where all buses operate from - but sometimes long-distance coaches and InterCity buses may have a different office location again. In smaller cities and towns, there might be a bus-station attached to the railway station. Or the i-SITE tourist information office may function as a bus station, sellng tickets for all the long-distances buses and with a bus-stop outside which is used by regional and long-distance buses. Or there might just be one bus-stop which is the central point for these buses, with no office or passenger facilities. 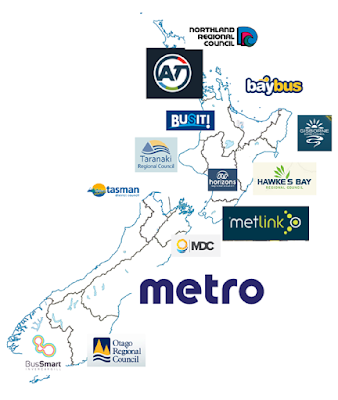 The latter approach is common if a company other than InterCity is the main bus-company in the area. And lots of locations have a bus-depot or bus-garage. Usually this is a place where buses park overnight or are dispatched from, not a people can catch the bus - although there is sometimes regular bus-stop right out side the door. The following list of main town and cities, sorted roughly from top to bottom of the country shows the bus-station location in each pace. 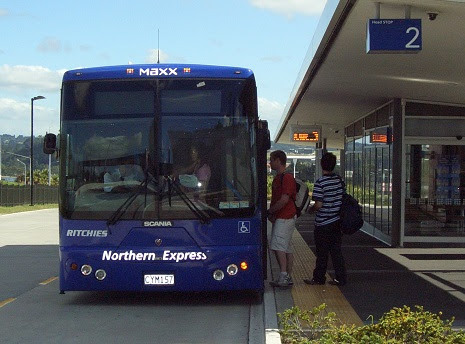 Don't assume that all buses stop at this place though - always check with your bus company which stop they used..
Albany - Elliott Rose Ave: west of the motorway at the Oteha Valley Rd interchange. Constellation - east of the motorway at Constellation Drive. Sunnynook - north of Sunnynook Rd, on the eastern side of the motorway. Smales Farm - east side of the motorway, by Smales Farm Technology Office Park. Akoranga - east side of the motorway, just north of Esmonde Rd interchange. Christchurch Bus Interchange / Whakawhitinga Pahi: Corner of Colombo and Lichfield Streets, access also from Tuam St. Includes a Regional Platform where city and long distance buses connect. All Newmans Coach Lines buses (to Tekapo/Queenstown): Rolleston Avenue, outside the Canterbury Museum (nearest intersection Worcester Boulevard). Dunedin Ritchies Intercity Travel 7 Halsey Street near the corner of Sturdee Street.